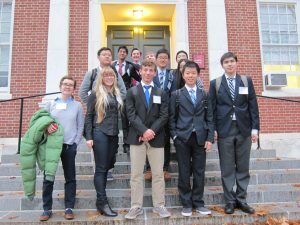 Twelve Williston students traveled to New Hampshire recently to participate in Phillips Exeter Academy Model UN VIII (PEAMUN 8) conference, which drew approximately 400 students from across New England. Williston’s debaters tackled issues such as child labor, reproductive rights, and state sovereignty. Twenty-five schools from New England participated in the simulation. Williston’s Josh Calianos ’19 was awarded “Best Delegate,” the conference’s highest honor, for representing France in the Security Council. Congratulations, Josh! 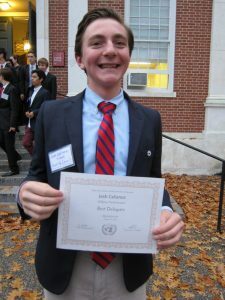 Josh Calianos ’19 won ‘Best Delegate,’ the conference’s highest honor. Previous PostWelcome!Next PostPresident-Elect Trump Inadvertently Advertises for Williston Model UN!